“Chiaroscuro” is the name for pin-hole cameras and the dramatic black and white underpainting of Rembrandt’s oils. Italian for “light-dark,” it was also an apt name for a program held Saturday, Oct. 28 at the Piedmont Center for the Arts, an evening of works that cast light into the darkest parts of human nature. The Circadian String Quartet teamed up with music historian Nicolas Hohmann to deliver three quartets woven together with storytelling and poetry. They performed Shostakovich’s String Quartet No. 8, Steve Reich’s Different Trains, and a new work by composer Sahba Aminikia, who was at the Center for the Arts for this world premiere. The Circadian String Quartet. 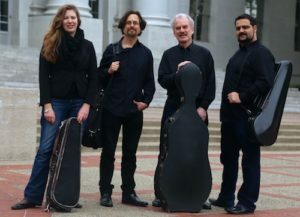 From left, Sarah Wood, David Ryther, David Wishnia and Omid Assadi. But before a full performance of that quartet, Hohmann moved us further into the mood with a poem by modern Russian composer and poet Lera Auerbach. Then cellist David Wishnia intoned the opening of the Shostakovich with four lean notes, a yearning motif and signature, then anchored as each performer repeated that motif. Omid Assadi brought a muscular gravity to the viola line, up a fifth, and then David Ryther layered in on the octave with the lowest notes of a violin. Violinist Sarah Wood took the top line, lush in the chords and fragile in her solos. This quartet is one of the most deeply felt expressions of grief ever written, using tightly internal motives that move in classical intervals, a private inwardness painted into universality. The lines crossed each other with angular symmetries and suddenly converged in harmonies that rang like church bells. These four artists created a remarkable beauty at the bottom of their ranges, mining bitter grounds and translating them into direct emotion. From thick accords they rose to a high wailing of strings, perhaps the terrible winds that Shostakovich heard in Dresden, the raw howls of 20,000 souls burning in the night. And after grief? Madness, menace, fear, and grief again. Truly, this is one of The Great Quartets, with a mocking and macabre waltz like Schubert’s Totentanz, and the dread “knock on the door,” thought to be Shostakovich’s fear of the KGB. And then a returning to slow lament. We were refrained from applauding, as Hohmann began to speak of how Shostakovich loved the rays of hope in Jewish music, of the minor scales that found joy in dark times. Violinist David Ryther composed with high drones to an ecstatic poem of mourning. So when all that’s left of me is love. This bent us back into the light, and then the strings took up simple arpeggios that built into complexity while ascending simple scales. Sahba Aminikia wrote this work for the Circadian Quartet with texts by Alan Ginsberg and the Persian poet Hafez, and those even cadences wove a slow minimalism. This was an extraordinary gift out of the darkness of war and into the light of love, and mirrored Aminikia’s own experiences, as a Bahai minority growing up in Iran. Once, after returning to Iran to visit his family, he was abducted and beaten by security forces, who left him stripped in the high desert. He woke with a deeper sense of the beauty of the world. Aminikian’s work prepared us for the final work, and that was another work of minimalism, Steve Reich’s Different Trains, written to compare the busy sounds of the trains of California in the forties with the trains in Germany at the same time. But the German trains were deporting Jews to extermination camps. This was a difficult work to hear, and also challenging to play, as the four players had to play against a sound track of the Kronos Quartet laying down dense train rhythms and train whistles and conductors shouting out destinations. This artistic response to the Holocaust took speech patterns and found the inherent musicality, with strings mirroring the pitches to create the everyday songs that are around us. The first movement was joyous and thickly repetitive stuff, rocking us into a torpor built on the heartbeat of train tracks and the slow screech of steel. The trains of Germany were slower, with discordant intervals and the sound of air raid sirens and panicked voices. Those impulses came together in the third movement, with the minor and major intervals merging and then turning high and almost bird-like, then slowing into silence. Afterwards, I could not search for the lightness in the dark. The sorrow was born fresh again and was too painful to process. But I thought of my cousin, Gitta, who was one of the hidden children in France during the War. She does see that light, and tells her story and teaches forgiveness in the prisons and inner-city classrooms of California. Like Ginsberg and the Sufi mystics, she is one who understands that the weight of the world is love. Originally published by the Piedmont Post.